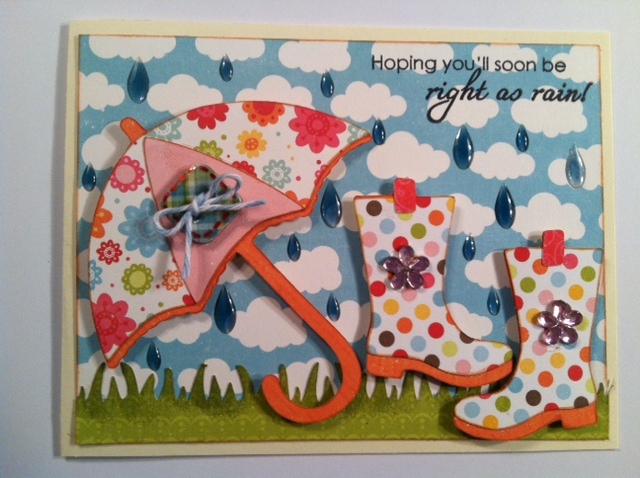 Craftin Desert Divas Blog: Hoping You'll Soon Be Right As Rain! Here's a quick card I made to enter the challenge at My Craft Spot. You're to include water on your project. I thought instead of a pool of water I would do rain drops. We have had some much needed rain here in Arizona lately. I thought the umbrella and rain boots were to cute on the Paisley Cachemire cartridge and had to use them. Hope you all have a great weekend! We are only 5 followers away from our $100. Michaels Giftcard. I'm hoping we can give it away by the end of this weekend. This card is absolutely adorable. Love this sentiment mixed with the fantastic Cricut cuts. So clever. Wonderful dimension and love those pops of flower on the designer paper. Too cute. I really like the papers you used on the umbrella and boots. This is real cute, love the sentiment and the way it fits the image. This is sooooo adorable!!! Love the cuts and beautiful paper!!! This card is too cute! I love the rain drops and flowers on the boots! Thanks for playing at My Craft SPot! Girls you are getting close. Need only 4 more... I'm so excited for you. I've tried to pass the word on as much as possible. 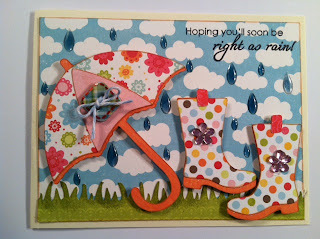 Beautiful card.love the DP and rain drops.So close hope soon you get those five more followers. This is so sweet! The bright colours are fabulous and perfect for a cheering-up card! Great job with those raindrops too! Love this card! Thanks for playing at My Craft Spot.